Sorry I don't have a recipe, but I wasn't measuring or intending to post it. However, pasta salad is hard to screw up Just chop, eyeball, add, mix, taste and repeat until it's to your liking. If you over do one thing or another, just physically weed it out. If you really screw it up, then just rinse the pasta off and start anew (and maybe sober up a bit). Flash forward to Sunday morning, a day that is sacred because it is the only day that I can sleep in and (most of the time) am obligated to do nothing. A day where I can enjoy a cold coffee with maple syrup on the front porch and build up an appetite as I mentally plan a day that will bring me enjoyment. The first thing to accomplish is to concoct a heady breakfast. Eggs are usually involved -- you may have noticed from previous posts. Now, a frittata is quite a simple and grande thing baked up into one little pot. Having already chopped several vegetables for the pasta salad, the most work I had to do for this dish was whisk together the egg mixture and cut the tortelloni's in half (they were huge!) I used a small cast iron skillet and it made 2 servings. I recommend expanding the recipe to feed a large mass...just use a bigger skillet. Heat butter in a small oven proof pan on medium-high heat. Mix together eggs and milk in a bowl. After butter has fully melted, pour egg mixture into pan. 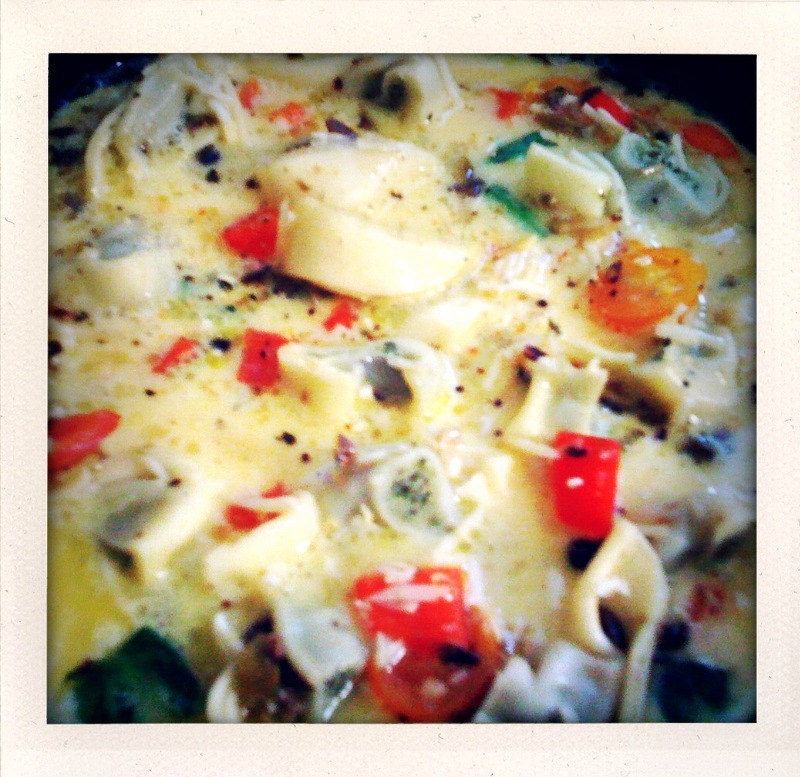 Evenly spoon pasta salad into the egg mixture. 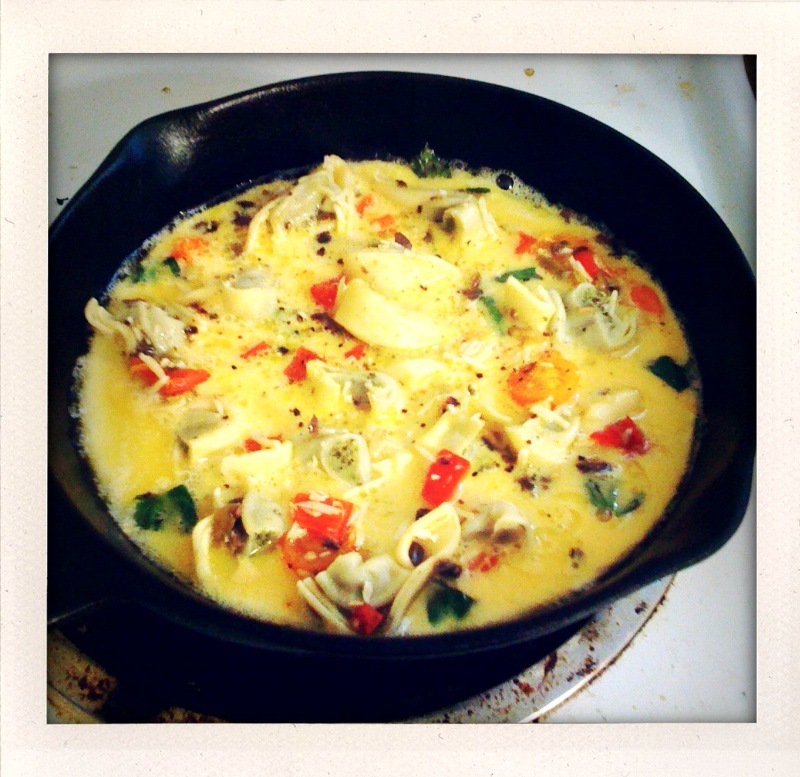 Let cook until the edges of the frittata are cooked. Preheat oven to broil (light broil if it's an option). Place pan in oven ~5 minutes to finish cooking the top of the frittata. Watch closely! Seriously, don't stray far. Keep the oven light on and park a chair in front if you have to. When eggs look fully cooked and there is no runny liquid when you tilt the pan, it's done! Slice into quadrants and slide out with a spatula onto your plate. This ended up being a completely excellent creation. Would go well with some toast or biscuits on the side. Yes, indeed.